While corporate strategy helps determine the long range vision for a company, the business environment is constantly changing, leaving a questionable impact on optimizing efficiency and effectiveness in a firm’s current operations. To help finance sectors to cope with agility and performance ratio, many companies are coming up with financial planning and analysis software solutions, which provide key financial modeling capabilities to help companies meet their budgeting and ongoing forecasting needs. The new software helps corporate agencies to model and evaluate different financial scenarios to set targets for their annual operating plan, in a bottoms-up or top-down manner, in order to analyze the variance between actual and projected results to manage end business performance. With the assistance of new technologies, the vendors create tools with which the businesses can easily access comprehensive financial reports and metrics that give a unique perspective into the operations. The software provides complete overview into an organization, with budgets that include costs, deadlines, deliverables, workflows, and summaries. It is now time for finance to demonstrate how it can support business strategy, competitive analysis, overall enterprise performance planning and management, and drive revenue and profit growth. In the last few months we have looked at hundreds of solution providers who primarily serve the finance industry, and shortlisted the ones that are at the forefront of tackling challenges faced by this industry. In our selection we looked at the vendor’s capability to fulfill the needs of the finance sector through the supply of a variety of financial planning and analysis softwares that support core business processes, including innovation areas related to cloud, mobile, Saas, PaaS and ERP, Big Data and analytics, mobility, and social media in the specific context of the finance industry. We also evaluated the vendors support for bridging the gap between IT and Operations Technology. 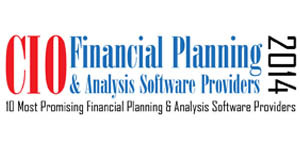 We present to you CIOReview’s 10 Most Promising Financial Planning and Analysis Software Providers 2014. Adaptive Insights Adaptive Insights provides business analytics solutions to businesses and non-profit organizations. arcplan Acrplan software solutions provides business intelligence, analysis and planning applications for businesses. Board International Provider of the industry’s only programming-free toolkit for rapid and cost-effective development of Corporate Performance Management and Business Intelligence software applications. Centage Centage is a growing software company that provides, automated budgeting, planning, and forecasting software. It is designed for small to mid-market companies and automates many of the time-consuming and error-prone activities associated with using spreadsheets to generate accurate budgets and forecasts. deFacto deFacto Global is a Microsoft-centric software company offering deFacto Performance Management, an enterprise-quality budgeting, forecasting, consolidation, analysis and reporting product that is packaged and priced for companies of any size. DEX Systems DEX Systems provides configurable logistics software solutions that are proven to yield lower operational costs, streamline internal processes, and derive more value from inventory assets of supplychain service companies. Forecast5 Forecast5 Analytics develops a suite of analytic tools that local governments can use across a range of administrative tasks and strategic planning functions. Integral Analytics An analytical software firm focused on operational, planning, and market research solutions for the energy industry. Kepion Provides a simplified approach to financial planning and reporting solutions for companies of all sizes. Vena Solutions A flexible, web-based application that seamlessly transforms Excel into a full-scale corporate performance management solution by wrapping manual spreadsheet processes in a controlled, database-centric environment with workflow processes, audit trails, and business rules.